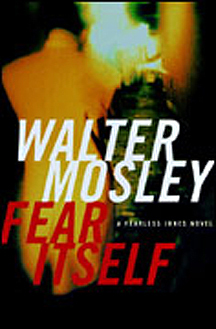 Walter Mosley's latest, ''Fear Itself,'' is a Brooklyn Bridge of plotting -- no minimalist, single-pier structure for this book, but an ornate, colorful structure of symbolic steel that only grows more beautiful the closer you get to it. And traveling over Mosley's latest bridge are more of his memorably drawn characters and a fascinating story set in 1950s Los Angeles, when the color lines were lit in stark contrast, before television had homogenized the middle classes. ''Fear Itself'' is second in what Mosley calls his Fearless Jones novels, which are narrated not by Jones -- who ''wasn't a smart man. A 12-year-old might have been a better reader, but if he ever looked into your eyes he would know more about your character than any psychiatrist, detective, or priest'' -- but by his friend, Paris Minton, who owns a used-book store. Fearless is huge, strong and fearless, and Paris is small and easily terrified, but they both do what needs to be done. Fearless gets in trouble, and goes to Paris to help him figure out what to do. Together, Fearless and Paris add up to a great detective duo, joining the likes of Sherlock Holmes and Watson, Archie Goodwin and Nero Wolfe, and Lincoln Rhyme and Amelia Sachs. In this book, Fearless awakens Paris in the middle of the night to tell about a pretty woman who needs help finding her husband, the watermelon man. Fearless had been working for the watermelon man, selling counterfeit Texas melons in Los Angeles, and didn't know his boss had been married. '''So then how'd you know that she really was his wife?' I asked, wondering at the endless gullibility of the deadliest man in L.A.
Paris fears Fearless' latest quest will get them in trouble, and he's right. Before long police and private detectives are both dogging them, and bodies start showing up all over Los Angeles. But, the case involves rich people, including the richest black woman in L.A., and before long Paris and Fearless are rolling in money from the several people who hire them. To find who and what remain mysterious for a while. It's enough to know that the biggest treasure of this book is something that would be beyond price to a man like Paris Minton, who loves books and who respects his black American heritage. It's a gamble for an author to undertake a complicated plot in this age of shortened attention spans. But the great and talented Mosley never needs to fear losing his readers -- Paris and Fearless capture our interest early on and never let us go. Visit Walter Mosley's web site.